for the past probably 10 years, i have been saying that i was going to retire when i was done being 30. well, yesterday i was officially done being 30, so it was time to reflect a little. on my last day of being 30, i had quit my job and was gainfully unemployed. i was riding my bike through the Great Basin of Wyoming, a dry, desolate place where i saw practically zero people. it was a monday, but i did not have to report to work or worry about any current projects or issues or problems. i cant say that riding through the desert of Wyoming would have been my first choice of retirement activities, but i would say that i met my goal nonetheless. lets see - what has happened since my last post? well, i am now in Rawlings, WY and only have 2 more days to go before i will be done with Wyoming completely. when i set out on this last stretch, there were no stores and no water so i was not looking forward to it. turns out that the first two days i did find water sources, so i was feeling pretty good. the third day was the big one though - i was supposed to ride 70 miles through the desert and then follow it up with 55 more miles the next day, all with no water sources. well, the 70 miles was long and hot and i got sunburned, but it actually went by pretty fast. so fast, that when i arrived at my planned destination, i still had a fair bit of sunlight left. since it was my birthday, i decided that i did not want to camp amongst the cow manure and sagebrush for the night, but i wanted to eat a real dinner. to make a long story short (and save my parents the worry of reading all of the details), i ended up riding all the way to Rawlings that day. by the time i got to the MiniMart in Rawlings, it was 2:15am, i had ridden 116 miles, and i was totally worn out. looking back, my decision to ride to Rawlings last night on almost no water without knowing the terrain was a very bad one. during the entire trip, i have been extra cautious and prepared and made good decisions, but yesterday i had a lapse in good judgement and i paid for it. i should have just been happy with my cow manure and sagebrush. i never thought i would make it this far, but earlier this week i finished the entire state of montana (over 800 miles in total). i rode through the Red Rocks Wildlife Refuge and saw some Trumpeter swans which was pretty neato. i crossed into idaho in the afternoon, rode the next day down an old railroad bed that was incredibly bumpy and tiresome, and by the next afternoon i was done with idaho as well. i rode along the southern border of yellowstone park and narrowly missed getting dumped on by a big thunderstorm. then i rode south through the Teton national park - very pretty scenery but very narrow roads and lots of people in motorhomes whizzing by only inches from my handlebars. a couple of days ago i had to ride over Togwotee Pass and Union Pass in the same day (both over 9200 feet) so that was a long hard day. today i am in pinedale, wyoming and about half done with wyoming. when i leave tomorrow, i have a 4 day stretch that has no stores and very little water, so i am not particularly looking forward to that. from there, it is about three more days until i get to steamboat springs, which is the unofficial halfway point of my trip. tomorrow i will go over the 1000 mile mark since starting out, so i guess i am making progress. no more close encounters with the native wildlife, and hopefully today is my last day in grizzly bear country. just a quick post to say that i am in lima, montana. i did the two sections from bannack to lima in one day yesterday, so i am back on my original schedule (for now). nothing super exciting to report from the last few days, but i have met some friendly people along the way. anyway, i am on a borrowed computer so i cant write much. i will try to post more and get back to those that have emailed when i get into the next town (which is probably a week or more away). well, i made it into helena the other day so i have now done about 400 miles of my trip so far. since i was in the biggest town of the trip, i treated myself to a hotel room so i could get a nice hot shower and sleep in a real bed. i even watched a bit of TV - quite a treat when you have been out in the woods for a week and a half. the night before i rode into helena, i had to camp out half way between lincoln and helena at a place called deadman's creek, down a dead-end forest road that looked like it had not been travelled on in quite some time. right from the start, i didnt like the sound of that. anyway, i was supposed to find a small campsite off of the route about a mile, but it had started raining pretty hard so i just found a suitable spot and set up my tent. there were signs of bear activity all around and the locals in lincoln had warned me that "that's bear country up there", so i wasnt feeling so great about my campsite choice, but i needed to get out of the rain. it was still early in the evening and it does not get dark here until almost 10, so i just sat around in my small little tent and tried to play the harmonica. i ended up drifting off to sleep pretty early, assuming i would get a nice long rest for the tough ride into helena the next day. however, a few hours later, i was awakend by the sound of rustling outside. i could hear sticks breaking as footsteps got closer to my tent. as it got closer, i could hear the sound of heavy breathing. it sounded like a 400lb. guy just ran a mile or something - it was deep and throaty. i layed perfectly still, not wiggling a toe or flinching a muscle. at one point i was not even sure if i was still breathing because i was laying so perfectly still. after what seemed an eternity but was probably like 2 minutes, the breathing and its source moved closer to my tent. i dont know how many of you have ever layed in a tent and listened to the sounds outside, but they always sound like they are so very close. however, in this instance, i was positive that the breathing couldnt have been more than a foot away - it sounded like it was right in my ear. i quickly ran through all of the things i had heard and read about dealing with bears in a situation like this. lay still, play dead, make noise, fight back - it was all very contradictory. i decided that i would lay still unless the animal got any closer (which would practically put them in the tent with me). if that happened, i remembered that i had a whistle on my camelback that was in the tent with me (thanks rick and adventure racing for making that required equipment that i never thought i would need). i planned to blow the whistle really loud in an attempt to scare off my heavy-breathing visitor. i layed still with my hand cocked back and ready to make a grab for my pack. then i heard a sharp noise outside, i dont know if it was another animal or a limb falling or what, but it scared my friend outside and it ran off into the woods. i layed still for another 10 or 15 minutes waiting to see if i would get a return visit. needless to say, i did not get any sleep the rest of the night. i vowed to get up at the crack of dawn and leave deadman's creek and never, ever return. 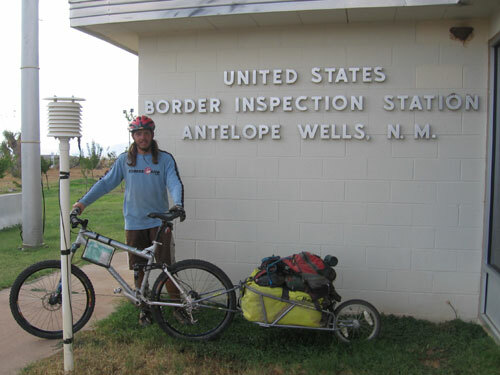 anyway, the next day's ride was tough, including two crossings of the continental divide. on no sleep and no breakfast, it was a very rough day. but i finally rolled into helena on thursday night. it felt good to take a shower and feel like a normal person again. i planned a late start the next day since the day's ride was short, but when i woke up, it was raining pretty hard and dark and cloudy in every direction. i tried to wait it out at a little restaurant across the street from my hotel, but the weather never got any better. i finally decided that the day was shot and i just stayed in helena one more night.